When you become a new patient at Premier Dental Group HI, we consider you part of our practice family. We love getting to know you, and we look forward to improving your smile together! The paperwork for new patients can be found below and brought in completed to save time. You’ll be warmly greeted when you walk in, feeling at home in our comfortable environment. If you haven’t brought in your forms completed, you can do so before seeing your dentist. You’ll be escorted to a private area to discuss your medical history and current concerns. We’ll determine which X-rays are necessary to take and do a tooth-by-tooth examination, as well as an evaluation of your gums. If indicated, a cleaning will be performed. To wrap up your visit, we’ll discuss any further treatment that is required. 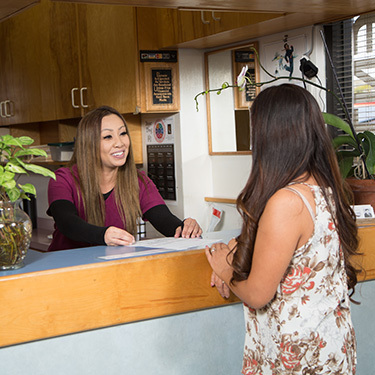 Insurance is accepted at Premier Dental Group HI, and our providers are in-network with many plans. We honor United Concordia Tricare and accept Care Credit to help you get the care you need. Contact us today to get started!